Bridgestone's viscous fluid type cabin mount has a main body consisting of various rubber and steel parts, plus viscous fluid which is injected into the main body. 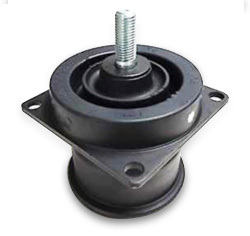 It can work as a vibration isolation rubber mount for the high vibration frequencies found in engines. However, the flow-resistant properties of viscous fluid act as an excellent damper against low vibration or impact force created by an undercarriage for example. And so viscous fluid type mounts are very good cabin mounts for construction machinery to reduce vibration and shock coming from tracked undercarriages thereby improving operator comfort and protecting the cabin and integral equipment from damage. Bridgestone offers a standard range of viscous fluid type cabin mounts with the following specifications. Contact your local Bridgestone Industrial office to see which one most suits your machine. © 2017 Bridgestone Industrial Ltd.